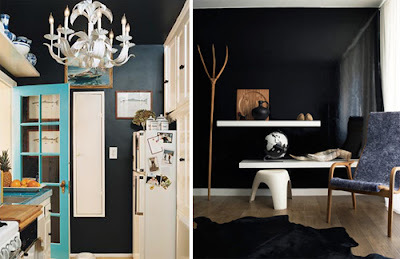 Lately, I have been obsessed with navy or black painted walls in your home. 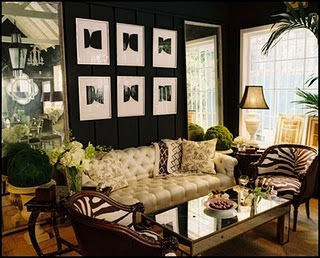 With such a dark backdrop, your furniture and accessories will pop and look rich. 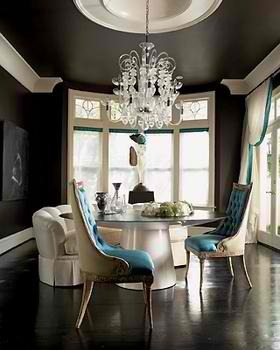 You can paint a dark color in any room of your home to create an elegant, yet casual feel. The white pedestal sink in the powder room, will have the same impact as a white sofa or chair in your living room. 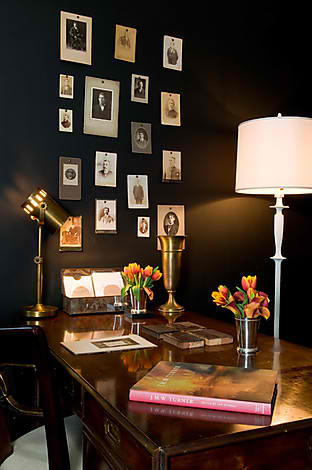 If you are not ready to paint the entire room black, you can try put a focal wall first and maybe even a dark grey. If you decide the dark paint isn't your thing, then just re-do it. That is the beauty of paint---you can paint over and over until you find the color that is right for you. I'm loving how the lime green flowers pop againt the black walls. ( It's one of my fav colors to combine with black in your home.) With dark walls, all of your furniture and accessories can be neutral and still create a statement . Plus, anyone can paint the art hanging on the wall. All you need to do is purchase a white canvas at your art store and mount it on your wall. You can always change the color tone by painting the canvas with a tube of white acrylic paint. Plus, it will give the canvas a glossy shine. This room is a great example of wood panelled walls done right. I like how the black paint from the walls has been carried onto the fireplace. This is a black painted bathroom done right! However, if orange towels aren't your cup of tea, you can always change out the color for white, violet or magenta. Personally, I love the the orange and turquoise combo. This dining room is a great example of how a black painted ceiling can make a room feel warm, cozy and spacious all at the same time. The ceiling defenitely becomed the focal point in this room, adorned with an elegant crystal chandelier. The black claw foot tube is a dream. 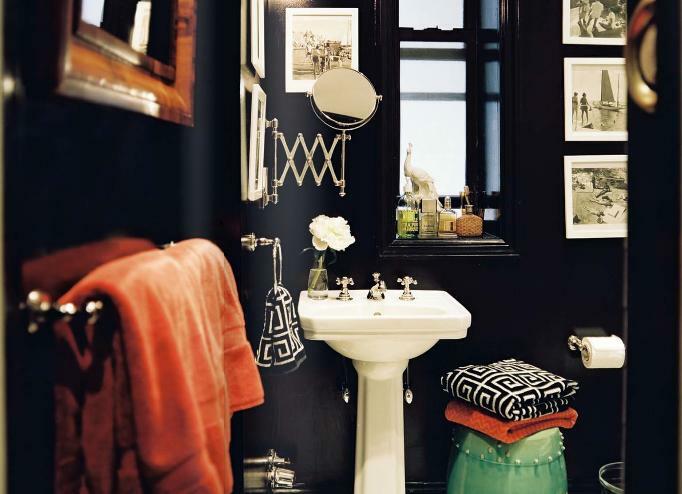 However, I'm not quite sure about velvet in the bathroom, but the color is to die for! 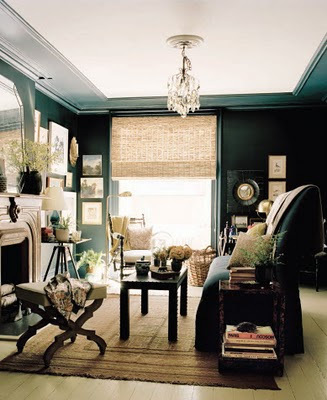 Don't be afraid to pull the crown-molding up onto the ceiling and paint it the same color as your walls. Instead of using paint, you can wallpaper a focal wall like in this kitchen. Plus, the textured paper, also acts as its own piece of art. Since black is a neutral color, the turquoise painted door trim totlly works. Black paint and a picture wall. What more could you ask for!